Minds in Bloom is very happy to present Michael Friermood and his guest post on anchor charts. We know you’ll find this very informative! 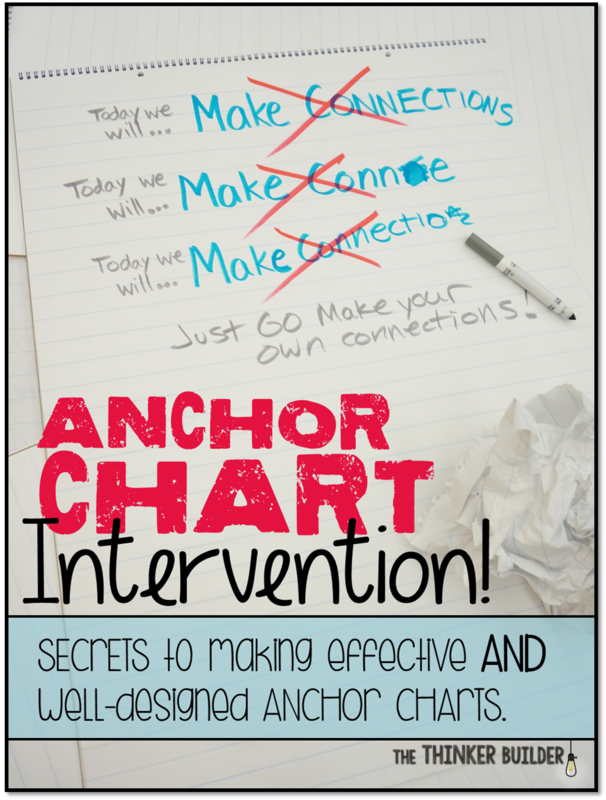 You don’t have to be an artist to make a great anchor chart. I mean, you can be an artist; it’s just not a requirement. It would be helpful if you are a teacher, though. Are you in? 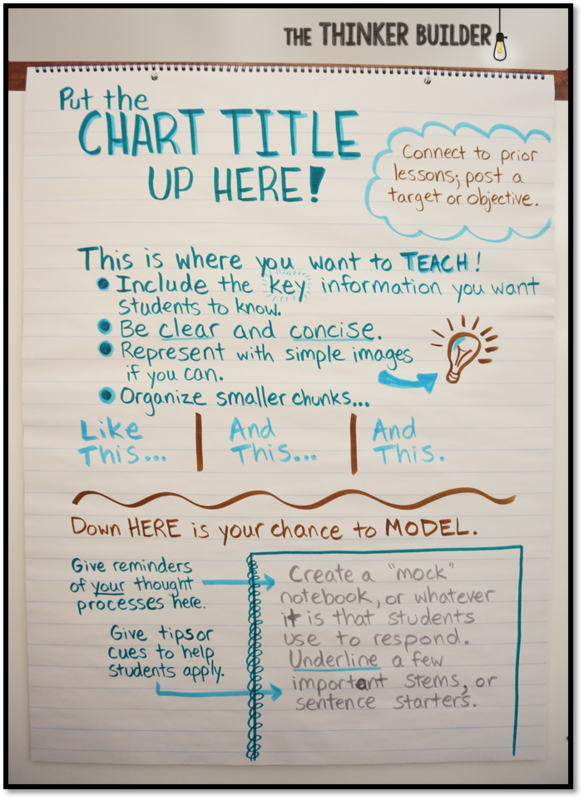 Well, I’d like to share some tips and tricks on making a great anchor chart, one that will do its job of anchoring students’ thinking to a strong model of a concept or a process, and one that is well-designed without taking forever to make. 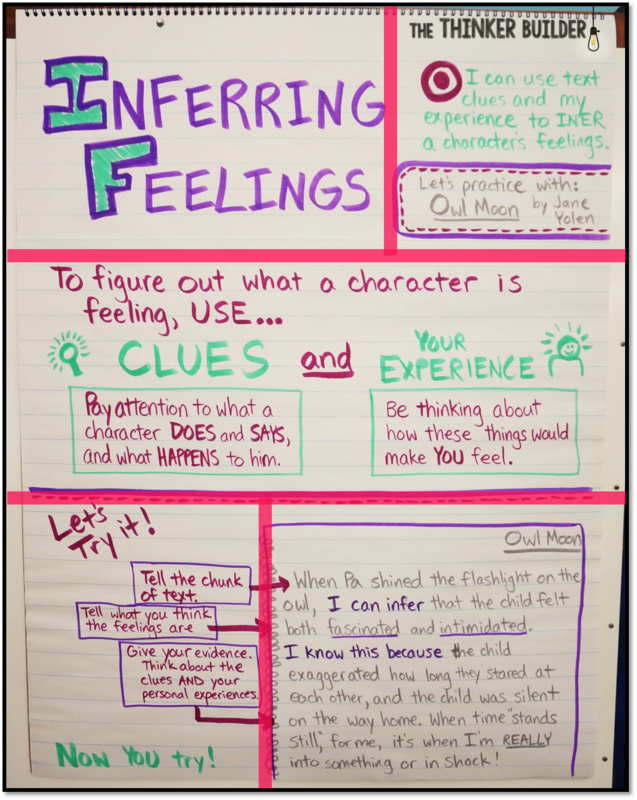 I’m going to focus on making anchor charts for reading comprehension strategies, but much of what I have to say can be applied to any sort of anchor chart. We’re about to start our intervention now. If your anxiety level just ticked up, take a deep breath and repeat after me… “I am not creating a masterpiece. I am creating a tool.” And this one… “This piece of paper need not last forever.” One more… “I can make this chart be effective AND look good.” If you start getting worked up again later on, just come back to this paragraph and repeat those mantras. Here, I’ll put a star by it so you can reference it easily: *Rather than showing you a bunch of anchor charts about different comprehension strategies, I want to show you just one, and really dissect it. 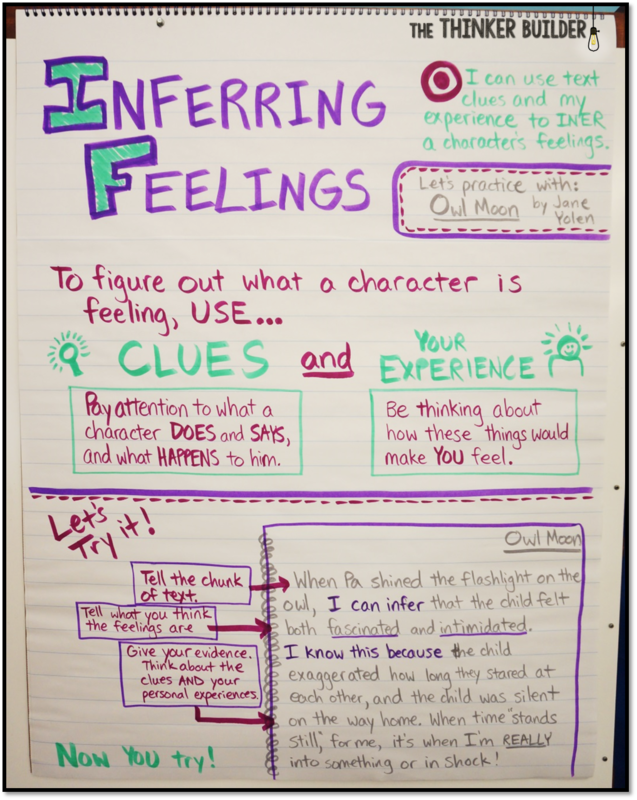 Below is an anchor chart I made for the strategy: “Inferring a Character’s Feelings.” It’s the one we’ll use. Think about the chart in sections. Mentally breaking the space into thirds can help you organize the chart, and thirds are naturally pleasing to the eye. But no measuring! Exactness is not necessary and will just stress you out. You won’t know how much space you’ll really need in each section until you are waist deep anyway. Let’s look at what might fit inside each third. In the top third of the chart, I put a title and my learning target (student-friendly objective). If I’m using a text during the lesson, then I’ll note that, as well. What irks many teachers is not getting their title centered perfectly. Centering is hard to get exact, so why bother? When I align my title on the left side, it frees up that nice little chunk of space on the right to add my target. In the middle third of the chart is where I record the most important pieces of the strategy I’m trying to teach. What will be most helpful for students to know and remember? Sometimes I write complete sentences, but I always look for chances to organize information even further with a table, a chart, or a bullet-point list. I also look to add simple visuals with which students can connect. Don’t go rolling your eyes at me saying you can’t draw. Think of them like symbols, not drawings. In the bottom third of the chart, I think it’s really important to have a record of a strong example. I model the strategy aloud with students, and record my thinking in the SAME FORMAT in which I’m going to want students to respond. Whether it’s a reader’s notebook, a graphic organizer, or a sticky note, I draw an enlarged version on the chart to use for my example. But don’t stop there! Notice the cues and tips on the left side of the notebook page. During the lesson, in addition to modeling the thinking behind using the reading strategy, I also want to capture my thinking about the response itself. I want to anchor it down so that when a student gets stuck on his own response, these cues can be a bridge to get on track. Step back now and look at the whole chart again. You can see our “thirds” and even smaller sections within. Color can brighten up an anchor chart, or it can look like a rainbow exploded. To avoid getting too color-happy, try to be purposeful with the colors you choose. Use color to help organize content and draw attention to certain information. How? I normally pick out three colors to make an anchor chart, not including a black or gray marker that I keep on hand. 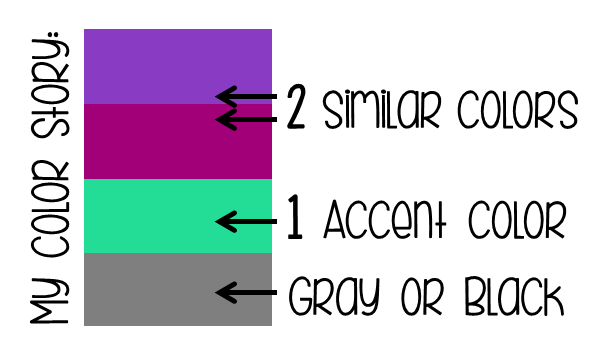 I want two of these colors to be similar: I’ll use them for the majority of the chart. Picking similar colors, or different shades of the same color, is easier if you have a wide range from which to choose. Every year I buy a pack of Classic, Assorted, and Bold Crayola® markers for this reason. The subtle difference between your two main colors will help distinguish parts from each other without pulling attention in too many directions. Then, I want the third marker to be an accent color that I’ll use less often. It will contrast nicely to make certain sections stand out. Just like with color, your lines matter, too! This is the other reason I like normal, conical-tip Crayola® markers so much. I can use the point for smaller lettering or thin lines, press a little harder to make something bold, or turn the marker sideways to get full-on thick. This applies not only when I’m writing actual words but also with lines that divide up sections of the chart or that frame certain chunks of text. I’m a proponent of creating the majority of an anchor chart right there with the students during the lesson. The power of an anchor chart multiplies when students actually see it being built. They make connections from what you are saying to what you are making permanent on the chart. I do like to have the “top third” information (strategy title and learning target) already written prior to the lesson. This saves a couple of minutes of lesson time, but more importantly, it gives students a little taste of what’s coming, and it helps me get off to a focused start to the lesson. Sometimes a strategy lesson might be pretty involved, or maybe it’s the first time I’m teaching it, and I want to be a little more planned out. 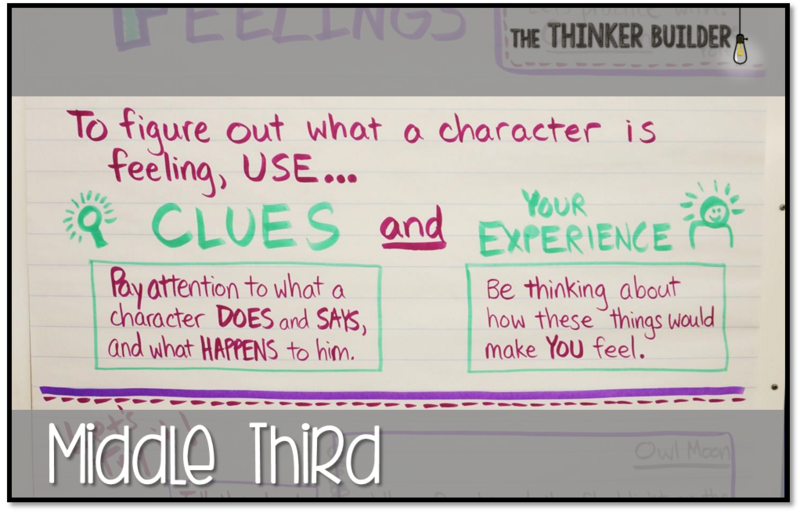 If that’s the case, I might sketch out some of the “middle third” beforehand, but I’ll flip the chart up and clip it so I can reveal exactly what I want at the appropriate moments of my lesson. In my experience, two reasons cause a student to refer to an anchor chart: (1) because they remember being part of its creation and (2) because I refer to it. So, for a reading strategy, I try to keep the anchor chart displayed in order to reference it during follow-up lessons or small group teaching. But after my kids have had practice with the strategy, I take the chart down. I may hold onto it for individual students struggling with the strategy, but I rarely keep a strategy anchor chart displayed permanently. If I did, the sheer number of them would make them fade into wallpaper. Don’t feel like every time you touch marker to chart pad, you need to be aware of all these factors and options and their grand effects on your students. Clearly, you want to be focused on teaching. 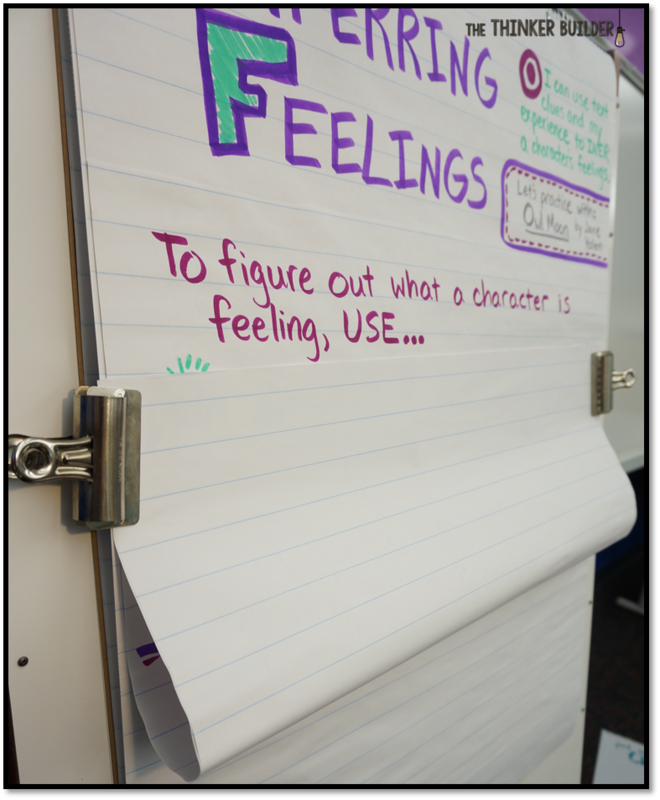 But, by incorporating a few of these tips and tricks, your anchor charts might just become more organized, more appealing, and more valuable to your students. And that is something to breathe easy about. Michael Friermood is a third grade teacher who encourages deep, bold thinking from his students. He has taught at the elementary level for ten years. You can find more fresh ideas for your classroom at his blog, The Thinker Builder. Wait, you mean you don't teach inerring? Ha! My students usually catch those little mistakes. Can I blame them? Just kidding. Oh well. Regardless, many thanks to Rachel for the guest opportunity here! I am so glad that I am not alone in the Anchor Chart Anxiety. Thanks for this post, it is very helpful. I can't wait to get to school and start creating. Great tips, thanks for sharing Michael! I'm not very artistic, and I love making anchor charts, but I never post them because they don't look anything like the ones on Pinterest! I love your "rule of thirds" for your anchor charts, as well as the excerpt of real life text that you include! I do swear by my Mr. Sketch scented markers though! Writing with chocolate and blueberry and grape just makes my day a little brighter! Fabulous post! Am pinning and will share on my FB page later! Great – great article and very informative. What a great post, as always Michael! I really like your chart template with all of the important elements. It's kind of like a "chart cheat sheet" ha! I am math chart challenged to put it kindly and just printed (and pinned) your chart template to put in my planbook! Thanks so much for sharing! This is one of those skills that should be covered in grad school. In my MAT we learn tons of theories but never these kinds of tricks. Thank you! When I noticed that my students were not using the anchor charts, especially my lower ability students I asked them why. They told me that a lot of anchor charts have too much information and it's hard to find what they need. I changed the way I did anchor charts after that and shared that info. with my teacher friends. 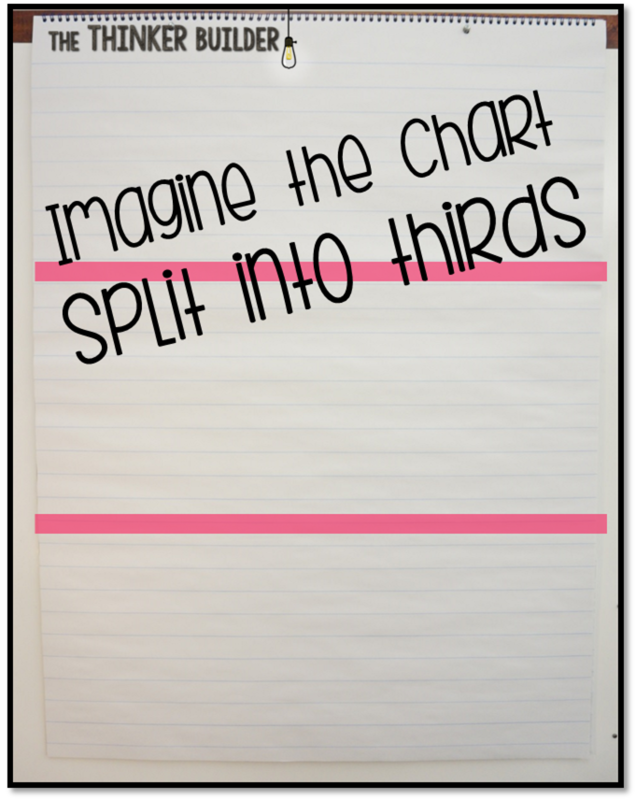 Your strategy of dividing the anchor chart into thirds will really help prevent a lack of clarity on my anchor charts. Thanks!!! If you taught multiple classes, would you create a separate anchor chart for each one? I only teach Math & Science to two different classes. Vicky, I teach 4 blocks of science. 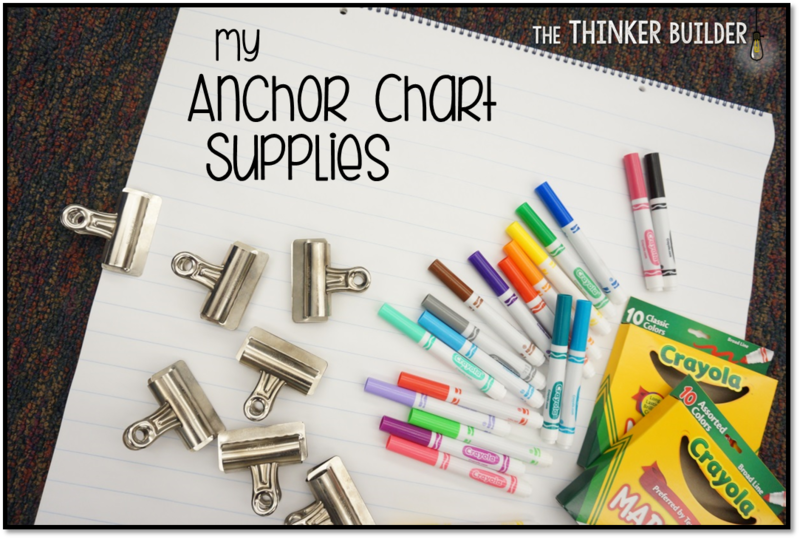 I will make an anchor chart with a title and outline, then for my 1st, 2nd and 3rd classes, I will use a piece of lamination film and dry erase markers to fill in the chart. When I get to my last block, then I will write on the paper. Every class gets to be part of making it without me actually making 4 different charts. That's a great question. I usually don't have multiple classes, but sometimes our third grade classes will do a science rotation where I'll teach the same lesson to all four classes. For something like that, I think the practical answer to your question is, no, I don't make more than one of the same chart. But to still make each chart feel "in process" for each class, I would use blank sheets of paper (or post-it notes for small sections) to cover up the key information, and reveal it at the appropriate times. If there is a section of the chart where student input and involvement will really impact what I write on the chart, then for the "second class" I would just write on the taped-over-paper that I've used to cover my writing from the "first class." And if I'm really thinking ahead, I might reserve a part of the chart for each class's idea/answer. I'd probably run out of chart paper too quickly if I was making multiple copies of each anchor chart, so I try to get around that without losing the underlying advantages to creating a chart WITH students. Ha ha. I thought you left the "f" out on purpose to make a point. Seriously, I did. This was an excellent article and very helpful to me. Thank you! That's a terrific post – so logical and helpful! This was SO helpful. I consider myself to be a fairly creative person, but when it comes to making anchor charts my mind goes blank. I've bookmarked this post so I can refer to it this week when I attempt to make some anchor charts using your formula. Thank you!!! Super helpful! Can't wait to bring these tips to my chart-making! Thank you! Summer just started, but I can't wait to use your advice next year. I want so badly for my charts to be Pintrest beautiful, but they never are. I think your guidance will help. Thanks for easing my anxiety. I loathe these charts. I can’t draw and I don’t know how to make block or bubble letters. Its very intimidating to hang up when other teachers’ charts look so awesome. It looks like you used some kind of tape to section off your anchor chart, what did you use? Hi! I love this! Btw where did you get your anchor chart clips. I’m trying to search for them but I don’t know what else I can put in the search bar besides large clips! Thank you for this! I thought I was alone in my hell of crippling anchor chart anxiety! This will definitely help. Looking forward to putting your tips to good use.